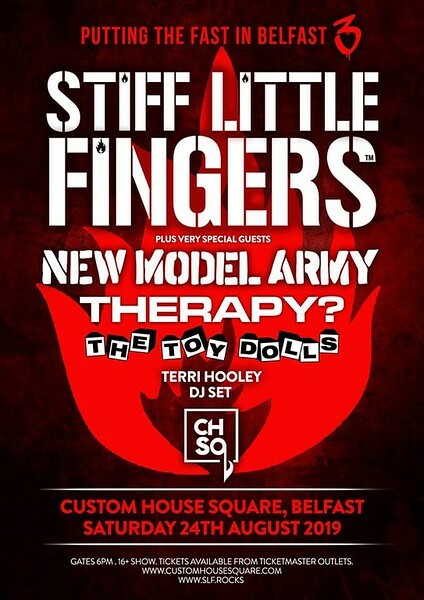 The latest announcements for the annual Custom House Square concerts today included the news that Stiff Little Fingers would be returning on 24th August for ‘Putting The Fast In Belfast 3”. Tickets go on sale on Friday 8th March. Support comes from New Model Army, Therapy? and The Toy Dolls with Terri Hooley doing a DJ set. Following their SOLD OUT Custom House Square show last year, Legendary NI Punks STIFF LITTLE FINGERS are back! at Custom House Square in Belfast on Saturday 24th August 2019 alongside an all-star lineup of special guests & friends including NEW MODEL ARMY, THERAPY? And THE TOY DOLLS. Tickets, priced £27 + Booking Fee, go on-sale Friday March 08th at 10am from Ticketmaster Outlets nationwide. After many studio albums and countless tours, Stiff Little Fingers find themselves more in demand than ever. Their most recent studio album “No Going Back” reached number one on the Official BBC Rock Album Chart. Though focused on their new material, they always play the old favorites at gigs. Jake said, "You have to strike a balance. The difficulty with a band like ourselves is to try not make it sound like a cabaret band. Obviously, it’d be very easy to go, ‘Hey, here’s another old one you may remember.’ A lot of the old songs the audience greet like old friends. I suppose it’s the same as any band that’s been around for any length of time. And yes, there are nights that we don’t particularly want to play “Alternative Ulster” or “Suspect Device” because we’ve heard them ‘til they’re coming out our ears. But there’s always the possibility that somebody out there has never seen the band before, never heard them."